There are a lot of things I love about summer, but one of the highlights is the abundance of fruits and vegetables available at the farmer's market. Front and center in many crowded market booths, the juicy and colorful tomato stands out in a sea of greens. Whether sliced and served on a plate with a drizzle of balsamic and a slice of mozzarella, or nestled between slices of bread for a classic sandwich, or used for cooking and baking in soups, stews, pie or quiche, the possibilities are nearly endless. One of my favorite recipes for tomatoes is Pork and Tomatillo Stew, which may seem like a fall and winter choice, but it tastes the best when made with the ripe and juicy tomatoes of summer. I stumbled across this recipe by Ruth Reichl when cooking through her book, My Kitchen Year, and I have made it many times since. The only problem with posting the recipe, is I never get a photo of the finished product! My family smells this stew simmering on the stove for several hours and by the time dinner is served, no one gives me time for photos. I promise, the next time I make the stew, I will take a photo and update the blog. For now, just trust me that it turns out wonderfully. Begin by cutting the pork loin into 2-inch cubes. Sprinkle them with salt. 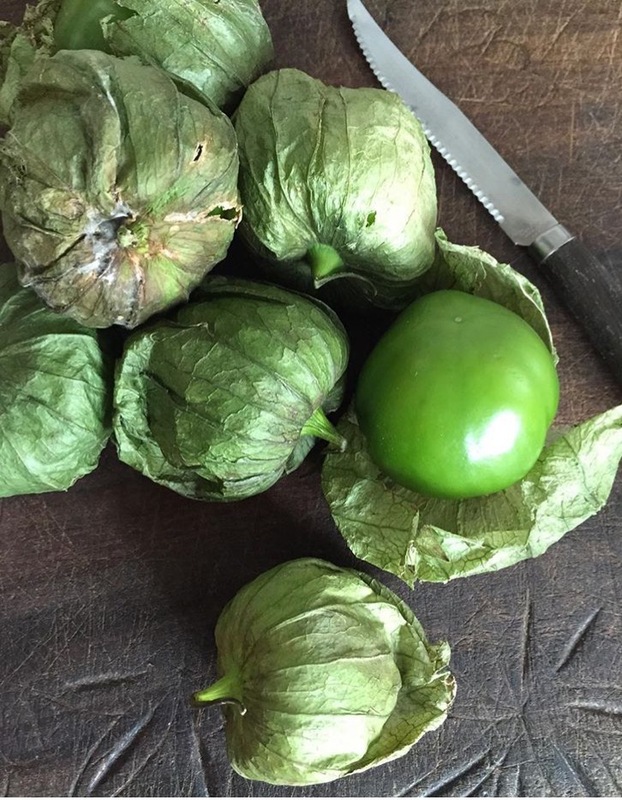 Remove the husks from the tomatillos, wash the sticky surface off, and quarter them. Put them into a pot with the tomatoes, the dark beer, and 1 1/2 cups of fresh orange juice. Let that stew for half an hour or so, until everything has become tender. Brown the pork in a large skillet, along with 8 to 10 whole cloves of peeled garlic, in a few tablespoons of oil. You'll probably need to to this in batches, removing the pork as it browns. Put the onions into the now empty skillet, along with the cilantro and jalapenos. Add salt and pepper to taste, and be sure to scrape the bottom, stirring in the delicious brown bits. When the onions are translucent (about 10 minutes), put the tomatillo mixture along with the pork and garlic back into the casserole and turn the heal to low, partially cover, and cook very slowly for about 2 hours. Squash the garlic cloves into the stew with the back of a spoon, add a cup or so of cooked black beans (or a can of drained beans), and cook for 10 more minutes. Tomatillos in their silky husks.